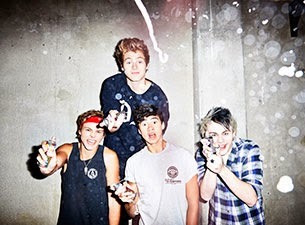 5 Seconds of Summer were forced to cut short their concert in London today (June 13) after guitarist Michael Clifford was injured by pyrotechnics. The news made #GETWELLSOONMICHAEL a trending topic on twitter Saturday night as fans wished him well. An image from Clifford's verified Twitter account showed him with half of his face wrapped in bandages. "Sorry I couldn't finish the encore but at least I look like two face," the tweet said. "Thanks for worrying." Video and images from the Wembley Arena concert show Clifford walking into a path of pyrotechnics as the band played. He jumps suddenly as a plume of smoke streams from his head.